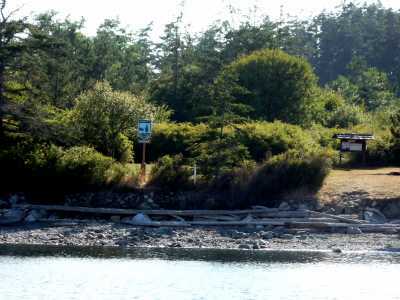 "Look for the Sign Ashore"
Information: Griffin Bay State Park is a 15-acre marine park with 340 feet of shoreline. The park is part of the Cascadia Marine Trail and reachable only by human- and wind-powered watercraft. Access: Visitors arriving by motorized vessels are not allowed to camp at the park, but may use the park for day use. No dock or buoys. The park has two pit toilets, four primitive camp sites (two close to shore and two 400 yards inland near the toilets, and trails. The site is on San Juan Island, 0.4 mile S of Low Point, across from Halftide Rock (watch the charts for this hazard). Look for the large Washington State Parks sign on the shore. Comments: Griffin Bay State Park is located in a beautiful bay beside the American Camp, home for American troops during the Pig War. ----- This is a small strip of public land land along the shore near American Camp, bordered on both sides by private property. Click here or more information on the Pig War. CCGriffin Bay, in the good ol' days, was the site of Old San Juan Town, a shanty town that grew up on the boundary of American Camp. The saloon was the primary attraction in town. When the county of San Juan was established, the county seat was placed in Friday Harbor. Now Griffin Bay is much quieter, remote from land traffic, and the saloon but an historic memory. CCToday the park is an area of open fields with shrubs and small trees that grades into an upland forest. It is a nice place for birdwatching, with varying habitats from shore to forest. There is a short trail into the forest that ends at a fence marking private property. No access is permitted beyond this point. CCThere is no dock and no state park buoys. 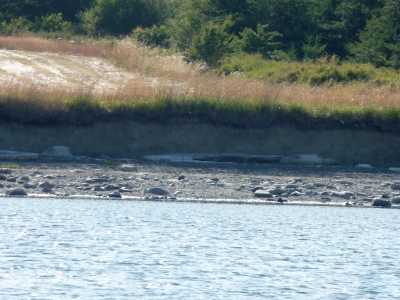 One can anchor, but the site is wind-exposed with the broad expanse of Griffin Bay and the San Juan Channel. We would suggest day-use for those in motorized craft.